The Green Monster is a popular nickname for the 37'2" (11.33 m) high left field wall at Fenway Park, home to the Boston Red Sox baseball team. The wall is only 310–315 feet from home plate, and is a popular target for right-handed hitters. The original ad-covered Green Monster in 1914. The wall was part of the original ballpark construction of 1912. It is made of wood, and was covered in tin and concrete in 1934. It was then covered with hard plastic in 1976. A manual scoreboard is set into the wall. Despite the name, the Green Monster was not painted green until 1947; before that it was covered with advertisements. The Monster designation is relatively new. For most of its history it was simply called "The Wall". The wall is the highest among current Major League Baseball fields, and is the second highest among all professional baseball fields (including minor leagues), falling approximately 6 inches short of the left field wall at the Santander Stadium in York, Pennsylvania. Ballparks occupied by professional baseball teams have often featured high fences hiding the field from external viewers, particularly behind open areas of the outfield where bleacher seating is low-lying or non-existent. The wall might also reduce the number of "cheap" home runs due to the barrier's relatively close distance from home plate. Fenway's wall serves both purposes. Past ballparks of Fenway's era or even later which featured high fences in-play included Baker Bowl, Washington Park, Ebbets Field, League Park, Griffith Stadium, Shibe Park, and more recently, Los Angeles Memorial Coliseum. Fenway is the last of the exceptionally high-walled major league ballparks. Relatively high walls in modern ballparks have been constructed for their novelty rather than by necessity, as Fenway's wall had been. During 2001 and 2002, the Green Monster's height record was temporarily beaten by the center field wall at Riverfront Stadium in Cincinnati, Ohio. During the construction of Great American Ball Park, located right next to Riverfront Stadium, a large section of seats was removed from the center field area to make room and a 40-foot (12 m) black wall was erected as a temporary batter's eye. The entire wall was in play. This new wall was often called "The Black Monster". When Riverfront Stadium was demolished in 2002, the Green Monster reclaimed the record. In honor of the famed wall, the Red Sox mascot is a furry green monster, named Wally. From 1912 to 1933, there was a 10-foot-high (3.0 m) mound that formed an incline in front of the Green Monster, extending from the left-field foul pole to the center field flag pole. This earthwork formed a "terrace", a common feature of ballparks of the day, whose purpose was to make up the difference in grade between street level and field level, as with Cincinnati's Crosley Field. It also served to double as a seating area to handle overflow crowds, another common practice of that era. 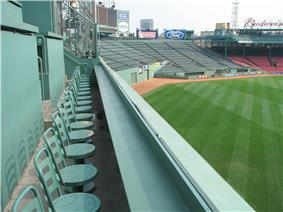 As a result of the terrace, a left fielder in Fenway Park had to play the territory running uphill. 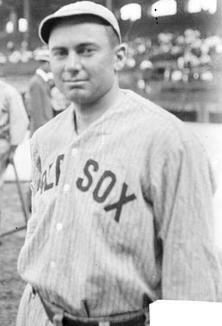 Boston's first star left fielder, Duffy Lewis, mastered the skill so well that the area became known as "Duffy's Cliff". In contrast, rotund outfielder Bob Fothergill, known by the indelicate nicknames of "Fats" or "Fatty", reportedly once chased a ball up the terrace, slipped and fell, and literally rolled downhill. The scoreboard was added in 1934. 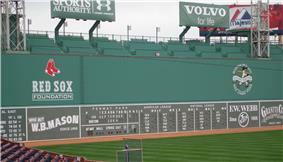 It forms the lower half of the Green Monster and is still updated by hand from behind the wall throughout the game. The American League scores are also updated from behind the wall. The National League scores need to be updated from the front of the wall between innings. There is also a board which shows the current American League East standings. There are 127 slots in the wall and a team of three score keepers move around two pound, 13 by 16 inch, plates to represent the score. Yellow numbers are used to represent in-inning scores and white numbers are used to represent final inning tallies. The numbers of the current pitchers weigh three pounds and measure 16 by 16 inches. Carlton Fisk's "body English" when he hit his game-winning home run in Game 6 of the 1975 World Series, "waving" the ball fair, was captured on a TV camera stationed in the scoreboard. An apocryphal story states that the camera operator had abandoned his post when he saw a rat scurry by, and the camera remained trained on Fisk instead of trying to follow the flight of the ball. After the wall was painted green in 1947, advertisements did not appear on the wall until 1999, when the All-Star Game at Fenway was being promoted. Various ads have appeared above the scoreboard since then, such as the Jimmy Fund. The Coke Bottles on the left light tower were a target for power-hitters when they were placed in 1997. These 3D advertisements were taken down before the 2008 season, when an LED sign was built above the new left-field upper deck seats. As a lead up to his 500th career home run, Manny Ramirez's home run count was tallied on the bottom of the light tower. Ads beside the manual scoreboard were added when the scoreboard was expanded. Above the manual scoreboard, where a Jimmy Fund advertisement had remained for many years, the logo for Covidien is now a prominent aspect of Fenway Park. An electrically lit Citgo sign can be seen from inside Fenway, located outside the park, in the view above the left-field wall. The famous sign, located atop the building housing the Barnes & Noble Boston University bookstore on nearby Kenmore Square, was erected in 1965, replacing a "Cities Service" sign (Citgo's old name) that had been there previously. The sign is kept as a landmark. On October 15, 2008, a small fire caused minor damage to the sign. The Red Sox current spring training home, jetBlue Park at Fenway South in Fort Myers, Florida, features a replica of the Green Monster. JetBlue's Green Monster even has Fenway Park's original manually operated scoreboard installed in it. Fluor Field at the West End, home of the Greenville Drive, has a "Greenville Monster" as well, as the park's dimensions replicate exactly those of Fenway Park. The Drive is the lower-A affiliate of the Red Sox. Hadlock Field, home of the Portland Sea Dogs, the AA affiliates of the Red Sox. This stadium boasts a replica of the Green Monster, nicknamed the "Maine Monster". Hubert H. Humphrey Metrodome, home of the University of Minnesota Golden Gophers baseball program and from 1982-2009, the Minnesota Twins. The 23-foot (7.0 m)-high blue tarp hung over the fold-away football seating was derisively referred to as the "Hefty Bag" or "Baggie," and had been an attractive target for left-handed power hitters. Santander Stadium, home of the York Revolution, has "The Arch Nemesis" that is 6 inches (152 mm) taller than the Green Monster. Telus Field, home of the Edmonton Capitals has a 34-foot (10 m)-high green monster which boasts the record of never having a home run hit over it [which could be because the wall is situated 420 feet (130 m) from home plate]. Ogren Park at Allegiance Field, home of the Missoula Osprey, Rookie affiliate of the Arizona Diamondbacks, has a 27 foot wall in right field, that is 287 feet from home plate. The park has a similar wall that is 309 feet from home plate, but not as tall. AT&T Park, home of the San Francisco Giants, has a 24 feet (7.3 m) high right field wall in honor of Willie Mays. Busch Stadium, home of the St. Louis Cardinals, has a seating section, formally known as "Big Mac Land" after former Cardinal Mark McGwire and fast food restaurant and sponsor McDonald's, boasting a free Big Mac for every home run hit into "Big Mac Land", making it a popular target for home run hits. Coors Field, home of the Colorado Rockies, was once a popular venue for home runs, because of the effect of thin air (and therefore more elasticity on the hit) on game balls until a humidor was finally installed to decrease the number of home runs; Coors Field also boasts a larger outfield to decrease home runs.